Smart Communication Equipment/ Technology Ami, Smart Meter, DCU, MDMS, IHD, Smart Household Appliances, PLC, RF, Smart Plug, WAN, AMR, IoT, HAN, and etc. HEMS, BEMS, FEMS, CEMS, Home Network Systems, Demand Response, Open ADR, Cloud Service, Big Data Service, and etc. Smart Electricity Distribution Apparatus HVDC, Inverters, Superconducting Cable, Voltage Regulator, Smart Circuit Breaker, EV Charger, and etc. Energy Storage System ESS, PCS, PMS, BMS, Capacitors, Secondary-cell Battery, and etc. Smart Power Generation System Power Distributor, Sunlight Generator, Solar Power Generator, Wind Power Generator, Hydro Power Plant, and etc. Others LED, Zero Energy Building, Smart Factory, New Energy Industry Consulting, and etc. 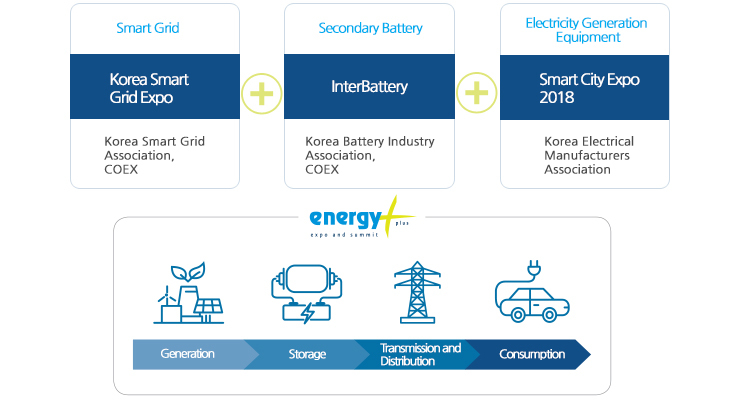 Korea Smart Grid Expo is co-located with four other energy-related exhibitions under one title, ‘Energy Plus’.